Luxury trekking in Annapurna is Located at 40 km from northern side of Pokhara there is one beautiful mountain range called Annapurna.The Annapurna was explored by the foreigner on the first time, till mid 1950 AD people were unknown about this beautiful mountain. Today, due to good reason Annapurna range is able to make one of the best trekking destination throughout the world for the scenic walk, alpine forest and very easy access in the splendid high Himalayan seating with mountain (Annapurna South, Hinchuli, Annapurna I (8091m), Gangapurna, Annapurna III and Mount, Fish Tail (Macchapurae), over 7000m making a beautiful mountain range. For the exciting adventure with comfortable lodges in Annapurna region (Annapurna Luxury Lodge Trekking) is the best way of exploring Real Adventure in Nepal. They provide the highest level of services and also far better than other which are available in those area. There are countable luxury lodge in Annapurna Region, there highest level of services whilst trek with beautiful gardens and other sundry services too. Arrival in Kathmandu Tribhuvan International Airport, a representative from Matterhorn Treks & Expedition will transfer to your hotel, We will brief about your trip activities. You’ll have rest of the day at leisure. Overnight at Hotel B/B. Sightseeing in Some of landmarks that are the World Heritage Sites of Kathmandu the sacred Hindu temple of Pashupati Nath, the famous Buddhists shrine (Bouddha Nath). Overnight at Hotel B/B. After breakfast, we will drive to the airport for a flight to Pokhara, 25 mins. The flight to Pokhara is spectacular with Himalayan view all along its route. You can enjoy the ambiance in the natural setting with impending Himalayas in a distance. Walk along the Phewa Lake or go boating in the evening. After morning breakfast, we will take deluxe tourist bus to trek point which is around (1 and half hours).Your walk will follow a rideline in the lower foothills of the Annapurna with surrounding view of pokhara valley .Then after our way will drip towards to Modi River Valley .Walking about 30 minute from Birethati, we will reach the Sanctuary lodge and we will have hot and delicious meal. In the afternoon you are free to observe the surrounding valley. The surrounding area is very luxuriant and you may grab the opportunities for bird watching as well as plant finding too. Overnight stay at Lodge. After morning breakfast, we will leave the lodge after walking through the remote forms following Modi River Valley. As soon as possible we will start to climb out of the valley and start to climb towards the mountain. Our walk (trek ) will pass through small village ,beautiful rice field and forest with eye-catching views of environment of valley . On the way of walk we will provide you snack. In afternoon, after the arrival we will provide you hot lunch. From the lodge you can have close viewof mountain .overnight stay at lodge. In the next day, from Ghandhurk you can have extremely good view of peaks including Annapurna South and Macchapuchare. Ghandhurk is lovely town of small houses which is surrounded by terraced field. The headquarter of Annapurna Conservation Area Project lies here .On the same day you may search about those area with your guide then after we will return to our lodge.Overnight stay at Lodge. After morning breakfast in the lodge,we will move towards the village and move downwards to reach the landslip and the remains of bridges washed away by the monsoon rains. From here our walk continues straight forward and we will follow one of the routes downward from the Annapurna Sanctuary. We trek down past terraces filled with crops and tiny village. Continue walk of two or three hours, we will reach Shauli Bazar. From here, we follow along the Modi River Valley until reaching cablebridge which will be cross by us in the first day. Then again, we will move on well-paved stone and partly on switch on switchbacks, then after 2 hours we will reach Gurung lodge and there will be warm welcome for us. Overnight at the Gurung Lodge. After having morning breakfast, we will start our trekking through the beautiful village called Patlekhet. Our trek walk will takes us through the sub-tropical forest which includes like Orchid trees, beautiful rhododendrons and magnolias. On the way, we will not continue our trek, we will stop our trek at the village of Pothana where many Tibetan people live and run the trade bussines. After some three and half hour we will arrive at the BasantaLodge . From the basanta lodge we can have overall view of Annapurna Range. After having some lunch at the lodge there will be free walk through the old village called Dhampus. Overnight stay at Basanta lodge. After morning breakfast,our trek will start from upland hill to ground hill side to the valley floor then after some one and half hours we will reach the road at the KhareaKhola at 999m, where bus will be waiting for us to transfer to Pokhara which may take around 40min. In the afternoon, you can analyze the pokhara environment as well as you can have fun in phewa lake by boating over there. Overnight stray in lodge. After morning breakfast, we will take deluxe bus to seti river camp and there we will have our lunch after reaching our camp area. After lunch, we will have adventure activities like rafting in Seti River. Overnight stay in camping. Day 11: Drive to Chitwan National Parks. After having some breakfast in the morning we will go for rafting for some hours .Completing rafting we will take bus to Chitwan National Park. Once we get in Chitwan National park our nature guide will take us for few hours we will enjoy the jungle safari in Chitwan National Park with nature guide. In jungle safari you can observe natural beauty and different types of rare plant and animals too. Overnight stay Hotel. This day will be different than other days because we will spend our whole day in jungle safari which will help you to entertain yourself in those beautiful scenery of jungle and you can see many wild animals which will be impossible to see in coming days. Overnight stay Hotel. After breakfast, we will Drive to airport for flight back to Kathmandu. Transfer to Hotel. 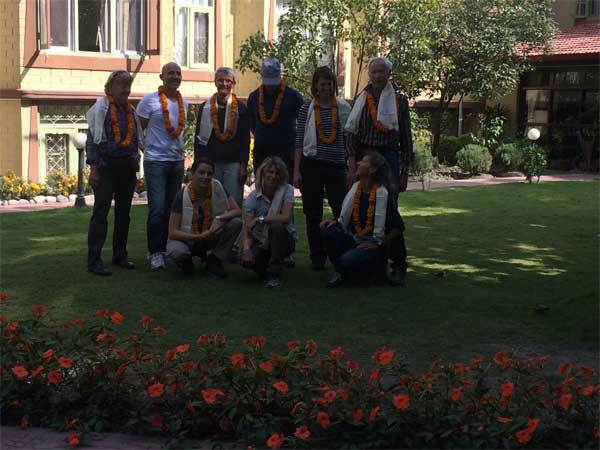 Day 14: Departure from Kathmandu. 1 hour and 45 munutes.